Escoda Primera Teijin fiber is a synthetic with thicker and stiffer fibers for work with heavier bodied paints. 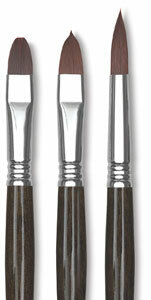 It's a great brush for painters using gouache, egg tempera, and even acrylic paints. The Teijin fiber is maroon colored and holds its shape and edge extremely well even with thicker paints. It works well in watercolor for edge and snap, but holds less water. 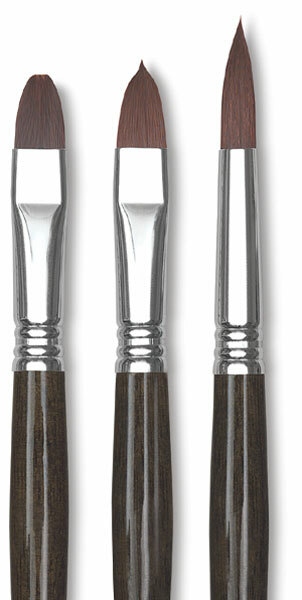 The short black lacquered wood handle is triple crimped to the nickel-plated brass ferrule.